Th-INK-ing of You: Sneak Peek! Hello friends! I hope you are doing well and are enjoying a wonderful week! I'm excited to be sharing a little "sneak peek" with you today! This card was made using the soon to be released Flourished Verses from Our Daily Bread designs! This set along with several more will be released Thursday, Mar 1! My card base is Mark's Finest Papers, the dp is My Mind's Eye Madamoiselle. I used several dies on this card... just love these dies: Cheery Lynn Italian Doily, Fanciful Flourish, Anastasia Border, Spellbinders Floral Doily Accents, Classic Circles Large. The ink is SU! Baja Breeze and the pearls and larger flowers were a gift from a sweet friend. The smaller flowers are Prima, and I sponged them lightly with baja breeze. Be sure to stop back by on Thursday for the release blog hop and lots of chances to win! Also...in March ODBD is celebrating it's 4th Anniversary, and there's lots going on, with many opportunities to have some fun and win more prizes!!! Check the ODBD Blog out often, and for a synopsis of all that's going on, stop by the ODBD Blog on Mar 8th! See you then!!! Oh my goodness, Grace. This is so stunning. What a beautiful card, and I love the sentiment. Love your layering of all the dies, and that DP is perfect! Thanks for the early morning blessing, my friend! Seu cartão esta magnífico !!! Your card is absolutely gorgeous, Grace! I love the blue and cream combo and the wonderfully embellished sentiment! Beautiful diecuts! Hugs! Grace! Сards in your blog are absolutely beautiful! Lada. Hello Grace. Oh wow, this is so pretty and very classy. I love how you have used the sentiment as the main focal point. Love the layering too. Grace, this is absolutely stunning. 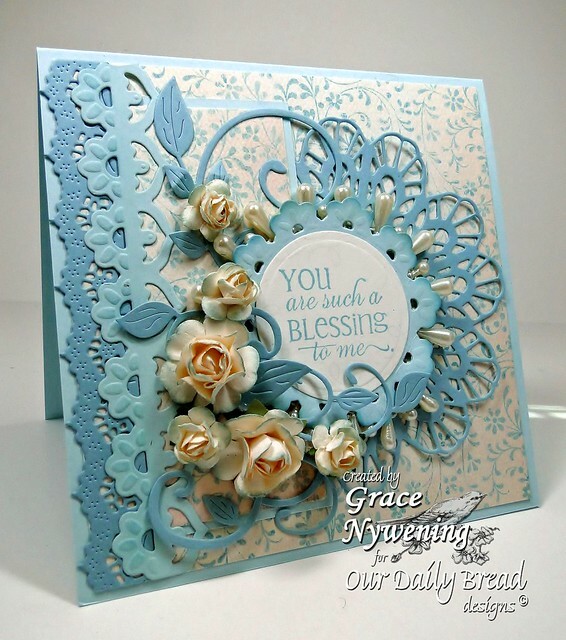 Beautiful backgroun paper and love all the different dies that enhance this lovely saying. Oooo my, Grace this is gorgeous. My favorite colors! I love everything about this card. Thank you for sharing this at my Word Art Wednesday challenge. I look forward to seeing your art each week. You are an inspiration as all your cards show your heart and love for the Lord. Thank you for that. Oh this is absolutely stunning! I love all the gorgeous dies and beautiful colour. Grace this is so lovely!!! Love it! Hi Grace! Well, another gorgeous card you have here. Thanks so much for sharing it with us and playing along at Word Art Wednesday. I hope you're having a great week filled with God's richest blessings. Thanks for being an encouragement. Beautiful blues, Grace! I really like the verse, great fonts. Gorgeous card! Beautiful colors and details. Thanks for playing along with our CropStop Challenge Blog. This card is beyond beautiful! Thanks for joining us at Sentiment Sundays and please join us again soon. Beautiful card....I enjoy all your work and don't comment enough, but this card is fantastic! Wow! All of your layering is just gorgeous, Grace. I also like your combination of blues. Very, very pretty. Stunning! Love the layout & all the different layers! Oh my - stunning use of dies and colours and loving those flowers. Hi Grace, if you gave anyone this card it would shake away the blues. I love all of the die cut layers and the sentiment, too. I love those flowers! They are lovely aren't they? I just ordered some. I wish ODBD carried them. I love the Italian doilyand the Fanciful flourish! I miss you my friend. I hope you and yours are doing well. Let me know when you have a moment. I'd like to know how God fulfilled our prayers. BEAUTIFUL card!!! I love the bling poking out from under the sentiment!! Thanks for playing with us at CropStop! Grace, this is gorgeous! I used to have some roses in my yard in Albuquerque, and they were lavender. This is beautiful. I love the flowers you added. The sentiment is perfect for so many different occasions. So elegant and beautiful. Love it! Oh my god! This is stunning! BEautiful! Thanks for shring with us at SFC!